Pálinka, the oldest beverage of Hungary, is consumed worldwide. Ingredients of each type greatly vary according to geographical location. This diversity was shaped by weather conditions and forces of nature. The most flavorful spirit is made in the Carpathian Basin; its aroma is unique world wide. Hungarian locals call it pálinka. 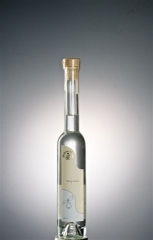 The first pálinka-like beverage is being mentioned in written documents during the 1320`s in Hungary. The so called "aqua vitae", Charles I of Hungary's wife's "water of life" was probably a brandy. Vernacular, serf direction: home distillation went on in the special distillatory huts, where they only produced for individual use. Sale, retail direction: at first pálinka was produced form beer and wine. Production went on at church and manor distillatory. During the 16th century burnt spirits were considered medicine. Distillation was a squirely privilege, so peasant's right to distill spirits was limited. Several prohibitions were also installed in relation to spirit distillation. For instance it was prohibited to use bread-grain for spirit distillation as well as it was prohibited to distill spirits during the time of service. Small businesses, spirit and pálinka factories began to appear from 1799 onwards and this lead to the central regulation of spirit distillation. In 1836 the pálinka tax was introduced, and from 1850 spirits became a state monopoly. From 1851 onwards it became compulsory for the pálinka distillation master to introduce his masterpiece to the city chief medical. In 1920, 260 pálinka distillatories operated in Hungary, by 1970, 1070, in 1982, 815 and today approximately 500 distillaries exist. The patron saint of pálinka distillation is Saint Nicholas. We only use ripe, healthy and unharmed fruits. Careful mash making and fermentation. 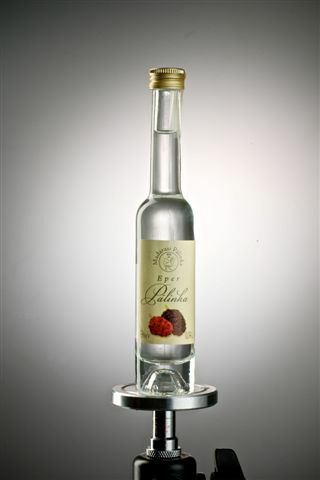 In high quality pálinka , the aroma of the fruit, is recognizable. The taste and aroma of the pálinka can best be enjoyed when drinking it out of the right shaped glass. This is the so called tulip-form glass which is round on the bottom and becomes narrow towards the top. 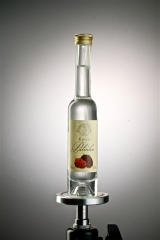 The only distillates that can be called pálinka are the ones that are made out of fruits and grape-marc grown in Hungary that is also prepared and distilled in Hungary and is free of sugar and other additives. Hungarian pálinka has always been an integral part of the culture, lifestyle and everyday life, but it has never been the means of getting drunk. The taste, smell and aroma of half a kilo of Hungarian fruit can be found in one shot of pálinka. This in itself is a miracle! Cheerio!